In all, a whopping 2208 Goals have been scored in the nineteen tournaments so far, with 1166 different players getting in on the act - 500 of these goals scored by just 50 players. There's always been a bigger focus on the goalscorers, and this article is guilty of this. Where we're trying to be different however, is to separate those great goalscorers - was your favourite a big game scorer, or a flat track bully? Our aim was simple on paper - find out who the Big Game Scorers are in the history of the World Cup. "No problem" we said - shouldn't take long. Wrong on both counts. As you'd expect from this site, there's an element of the scientific behind the approach but football isn't always black and white. For a start, the last World Cup had 32 teams competing (there's already talk of expanding to 40 in future installments), compared to the 13 that competed the first edition in 1930. Chuck in a changing format (I'm looking at you 1950, '74, '78 and '82) and certain adjustments have to be made (see below). In 1994, the Golden Boot was shared between Russia's Oleg Salenko and Hristo Stoichkov of Bulgaria. On paper, they're both deserving of the appreciation that the title gives. However, Salenko scored 5 of his goals in a group game against Cameroon (which was a dead rubber) after both teams were already out. Stoichkov on the other hand, scored 3 in the group stage (including 2 against Argentina), as well as one in the Last 16, the Quarter Final and the Semi Final. And it's the 1994 golden boot gives the best example of what we're trying to prove here. With the example of the 1994 World Cup in mind, we decided to create a weighting system based on two major derivatives - the quality of Opposition and the stage of the tournament. 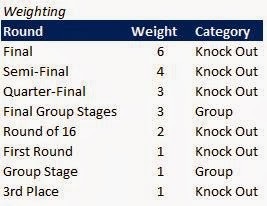 Add in those two variations and you've got a points system decided by the weight of the stage divided by the rank of opponent (with the exception being the Final, where full points were awarded for both teams). Fortunately for us, FIFA decided in 1986 to put together a retrospective ranking system based on every tournament from 1930 to 1986, based on performance in the tournament and also each team's qualification record. Even more fortunately, they continued this ranking system after each tournament - giving us a sound basis for the stats. The First Round existed in the 1934/38 Tournaments instead of Group Stages - so when the Dutch East Indies (Now Indonesia), made their way to France in 1938, they probably hoped to play more than one match before the long journey home. No real great surprise in the winner. Pele played an scored in four tournaments, and most importanly, is one of only four men to have scored in two separate finals along with Vava (2nd), Zidane (3rd) and Paul Breitner in 10th. Also in the Top 10 is Geoff Hurst, the only man to have scored a Hat Trick in the biggest game in Football. The talking points begin when looking at certain names. Brazil's Ronaldo is the top scorer in the World Cup history yet his 15 goals are worth less than Zidane's five. How so? Well Zidane has three final goals to Ronaldo's two, plus a Semi Final goal and a Round of 16 goal. Zidane is such a big game Scorer, that he doesn't even bother in the group stages. Ronaldo on the other hand, has seven group goals - against the likes of China, Costa Rica and Morocco. Though he's not really too much of a victim here - he's still in the Top 5 of the Big Game Scorers in the World Cup. 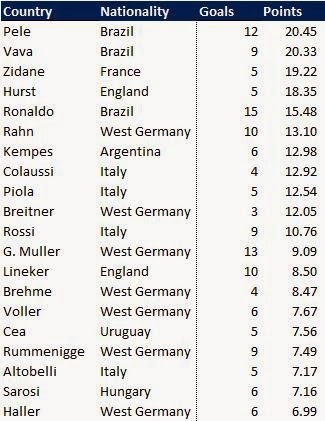 How does he compare against the second and third top scorers in World Cup history? Well it doesn't look too good. Fontaine had the decency to at least score in the Semi Final. Klose on the other hand had a good 2002 World Cup on Paper - scoring 5 goals. However, he also played in the Quarter Final, the Semi Final and the Final that year, all without scoring. Similarly, he top scored in the 2006 World Cup on home soil, and only scored in one of the three knock out games he played (the Quarter Final with Argentina). 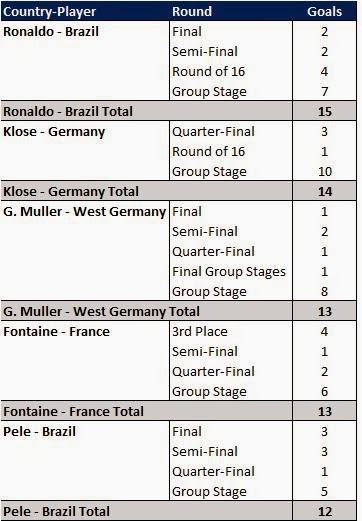 At the time of writing, Klose is still in with a shout of playing in this year's World Cup and only needs one more goal to equal the record, but as you can see from above, he'll need to do more in the latter stages to really earn a comparison with Ronaldo. Paul Breitner was the most efficient with his goals, scoring just three but gaining a place in the Top 10 Big Game Goalscorers. Two of his three were in World Cup Finals (1974 and 1982), to add to the group stage goal against 22nd Placed Chile in 1974. In fact the only player not to score in the Final from the Top 20 is England's Gary Lineker. Whilst he has a 50-50 split in Group Stage/Knock Out goals, his Semi Final effort in 1990 was against eventual winners West Germany, whilst his Quarter Final effort in 1986 (which won him the Golden Boot) was also against the team ranked in the number 1 spot - Argentina. Evidence of reward for scoring against the best opposition. But what of the Flat Track Bullies? Well we've seen the impact of Klose and Fontaine, but they're certainly not the worst offenders of the prolific scorers. One of the World's Top Strikers in the 1990s was Gabriel Batistuta. In fact he was the first man to score a hat trick in two World Cups. Overall, he has 10 goals to his name in the World Cup. His position based on the weightings? He's sitting in 181st place. In this instance, his hat trick in 1994 was against Greece - the team that FIFA ranked 24th out of 24 in that Tournament after they lost all three games, conceding 10 and scoring none. Similarly in 1998, Batigol's hat trick was against Jamaica (ranked 22nd). Of his 10 World Cup goals, 8 of them were in group games and the two knock out goals were both in the Round of 16 (and penalties at that). Undoubtedly an incredible player - but his big game credentials could be questioned on this stage. Elsewhere, German pair Uwe Seeler and Jurgen Klinsmann have 9 and 11 goals respectively, which are only good enough for 213th and 153rd places. Raul's 5 goals for Spain, see him ranked in 402nd place in the points scored. Someone that normally draws attention in these lists is Maradona. He ranks in a respectable 69th place (out of 1166 players remember). His 8 goals include two at the Semi Final stage against Belgium (4th) and two in the Quarters against England (ranked 8th) - even though he should have points deducted for that hand ball! That sees him tucked in nicely between fellow South Americans Daniel Pasarella and Uruguay's Diego Forlan. For those looking to be a bit more current, Messi has just one goal in the group stage, Cristiano Ronaldo has just two and Luis Suarez's exploits in South Africa saw just the three goals. The highest ranked player eligible for 2014 is Andres Iniesta, largely due to his winning goal in 2010. It's fair to say that there's not as many big game scorers in modern times. So what does all of this tell us? Well first and foremost, you should never just look at the goals scored column. Yes, it's an impressive achievement to score a large number of goals in the World Cup like Batistuta or Klose, but they're flattering to deceive on the biggest stages. Players like Brazil's Ronaldo and West Germany's Gerd Muller scored in pretty much every round and the occasion and level of opponent didn't seem to get to them (the strange case of the 1998 Final aside). And then there's the specialists who seem to come alive in the late stages - Hurst, Zidane, Breitner and Brehme. Another aspect that became clear when putting the stats together is that it's a lot harder to score now. The average number of goals per game peaked in 1954 at a massive 5.38 compared to 2010's 2.27 (second only to 1990's 2.21). Should this be taken into account? Quite possibly. We believe that the ranking system has counted for this (see talking points) but it's certainly worth a discussion. We know that football isn't just about statistics and goals, but you'd still expect the big name goal scorers to be the big game goal scorers. That's not always the case.